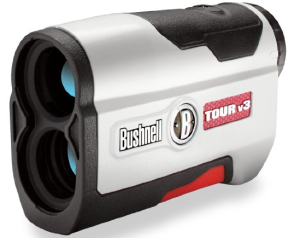 The Bushnell Tour V3 Jolt Standard Edition Golf Laser Rangefinder is the perfect piece of equipment for beginner and professional golfers alike. This rangefinder features a laser with a rangefinder to measure from 5 yards up to 1,000 yards +/- 1 yard and allows golfers to measure the accurate yardage for each and every shot. It is best know for being user-friendly because it can be held with one hand and includes an easy-to-handle, no-slip grip that improves the accuracy of the laser rangefinder. This rangefinder has a 5x magnification that enables golfers to receive a high-quality image for far-away and close-up shots. With a 3-volt battery, this rangefinder will be ready to use right out of the box and will provide dependability on the golf course for months after the first use. With state-of-the-art technology, the Bushnell Tour V3 Jolt offers many quality features for a great price. The Tour V3 comes equipped with Pin Seeker and Jolt technologies. The Pin Seeker technology allows users to scan the fairway and surrounding areas to identify any barriers, bunkers, or slopes. This technology provides users with updated information about the landscape on the rangefinder’s screen to identify the perfect shot. In addition to the Pin Seeker technology, the V3 also features Jolt technology that provides a scanning mode, which will provide a jolted vibration that notifies the user when a target has been found. The Jolt technology makes it simple and easy for the golfer to find that desired target and get lined up to hit. It is the best solution to finding the perfect range for the perfect shot, every time. Many customers who have tried the Tour V3 Jolt Rangefinder have commented on how easy it is to use right out of the box. This rangefinder does not include any calibration or set-up that will make it difficult to begin using. You can take it right from the box to the golf course. Other customers comment on the helpfulness of the Jolt technology because it provides them with a vibration when they have found the desired target. These customers also explain that this technology gives them confidence in their yardage and, ultimately, in their shot. This rangefinder replaces the “guessing” of your golf game with confidence in each and every shot. Other reviews compare it to other rangefinders and GPS systems in a comparable price range, and customers seem to choose the Bushnell because of features it has that other systems do not. The Bushnell Tour V3 Jolt has the LCD display screen that customers prefer over other GPS systems. Customers replace their GPS systems with a Bushnell Tour V3 Jolt because it gives them more confidence in the range of their shot and provides them with a clear vision so they do not second-guess their shots. The reviews that can be read about the this rangefinder emphasize that it can improve every golfer’s game and lower their handicap. It provides support on the golf course to give accurate yardage and confidence for every shot. Some golfers want that little bit of extra help when they are playing for enjoyment and others want that extra support during tournament play. This laser rangefinder has something to meet the needs of everyone. Every golfer should have a Bushnell Tour V3 Jolt in their golf bag.